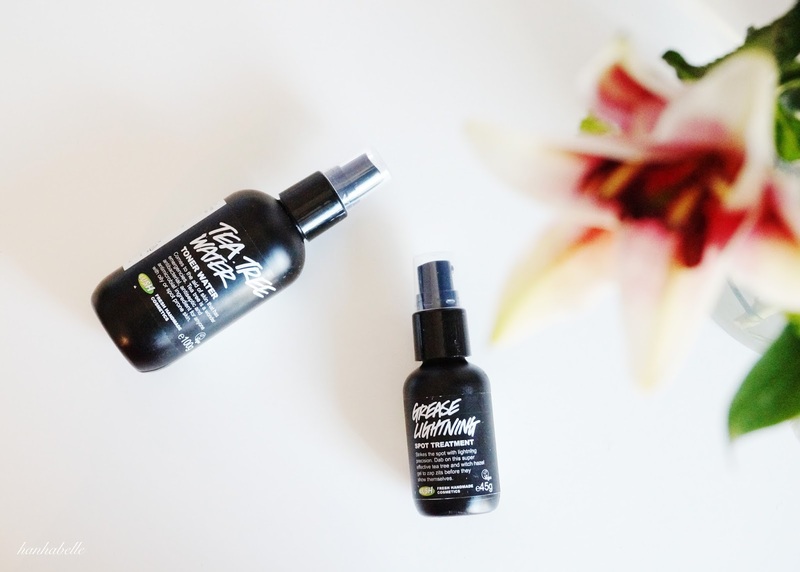 An effective blemish fighting duo I've been using and loving recently is from Lush, after a great review from Miss Makeup Magpie, I knew I had to pick up Grease Lightning, this seem like the perfect spot fighting gel at a reasonable price. I also couldn't leave without picking up the Tea Tree Toner Water to add to my bag. I'm definitely guilty of being impatience with new skincare wanting results overnight, but couldn't be more pleased with these products from Lush for clearing up my congested skin in a short amount of time. I know toners divide many of you - do you really need one? What does it actually do to my skin? I'm definitely in the toner camp as it refreshes my skin and preps it's nicely for serums and moisturiser. One of my favourites is the clarifying toner from REN - which I love but seem to run out so quickly and it's not the cheapest bottle out there at £18. So step up this toner water from Lush that contains the antibacterial ingredient Tea Tree (obviously it's in the name!) which is super effective at fighting bacteria that causes spots. It also contains natural calming and antiseptic ingredients grapefruit and juniper berry. The spray bottle comes in 2 sizes - £3.95 for 100ml and £7.50 for 250ml, which are great prices I wouldn't hesitate to repurchase. I go a little spritz happy with the spray but it feels so refreshing on the skin, it doesn't sting or burn but leaves you with a nice tingly feeling. The product dries on your face after a few minutes ready for moisturiser. If you don't like the idea of spraying it onto your skin, you can also use a cotton pad which is just as effective. I don't have terribly problematic skin but like to keep spots and blemishes at bay, this toner is great at keeping skin clean and fresh without over drying it. Grease Lightning is my new go to spot treatment, favouring it over the Origins Super Spot Remover (I know right?!) This Lush treatment gel is packed full of natural ingredients aloe vera, sea water and witch hazel to name a few. It's a light gel formula, which you pump out and pat onto the offending area. Unlike other spot treatments it feels refreshing on the skin and does not sting and feel tight. It leaves a thin film on your skin and dries clear. I use it on small areas on my T - Zone where pores get clogged easily, one pump goes a long way and you do get more than you need. Im shocked to hear you like Grease Lightening over the Origins one- the origins one is my FAVORITE so I will have to give this one a try. It has been awhile since I have try anything from lush. I remember liking their masks back in my teen days. I should really give grease lighting a go since I have read so many good reviews about it! I've been meaning to pick up the Tea Tree Toner Water! I've tried both of those, and love them! The tea tree toner was part of my skin regimen when I had troubles with breakouts, and more recently I tried Grease Lightning for the odd spot that pops up & love it. In fact, when I had the most problems with my skin, I used nothing but Lush and their products were always super effective! Hope these work out for you Claire. It's a must buy for me now! I have been using this duo for a number of weeks now, and also absolutely love it. I get spritz happy too and love how refreshing it feels! I will definitely be repurchasing this toner water in the larger sized bottle. I am also really pleased with the Grease Lightning treatment and love how it fights blemishes without drying up any surrounding areas. Lovely post and your photography is beautiful. Hi Rachel, I like your review on these products as well. I love how natural and effective these 2 products are, I'm forever looking for products to keep blemishes away and I think I've found them!